When you learn how to make a chocolate fudge cake you will find it to be a chocolate lovers fantasy. Anyone who likes chocolate loves a chocolate fudge cake recipe. This is a term which originated in the United States, particularly in the South. 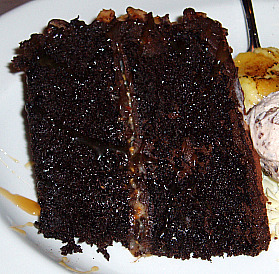 This description refers to a rich dense and moist chocolate cake. The richness is accomplished by the chocolate which is used in the recipe; whether it is cocoa powder, melted semi sweet chocolate or melted unsweetened chocolate. Quite often a combination of these chocolates is used for added richness in many chocolate dessert recipes. Milk chocolate and German chocolate although very delicious do not qualify as producing a rich chocolate. To accomplish a richer chocolate and delicious flavor, I love sprinkling the cooled cake layers with Godiva chocolate liqueur before frosting the cake. I am including some delicious chocolate fudge recipes for you to try. The first chocolate fudge cake recipe is made with dark cocoa powder and buttermilk; a great combination. I have paired the chocolate cream cheese frosting recipe for this cake although it is delicious with any cake recipe. If you are learning how to make chocolate fudge cake the fudge brownie cake is an easy one to make; it is made from a package of brownie mix. Last, I want you to try this delicious fudge bourbon cake recipe with a special bourbon fudge frosting recipe. These are all sure to please the taste buds of chocoholics! This recipe contains one of my favorite ingredients, buttermilk, for moistness. Other ingredients to look for in cake recipes which produce moistness are sour cream and mayonnaise. Grease and lightly flour 3 eight inch round cake pans. Beat egg whites until very stiff peaks form; set aside. Cream butter, sugar and egg yolks until light and creamy. Sift all dry ingredients one time, do not presift flour. Add dry ingredients to the cream mixture alternating with the buttermilk. Fold in the stiff egg whites and nuts. When cakes are cold assemble with frosting. Beat all ingredients until smooth and creamy. Spread between layers, sides and top of cake. This chocolate fudge cake recipe is a brownie mix recipe. Although I almost never buy boxed foods of any kind I have found a brownie mix to produce the very best brownies. I use a brownie mix to make this easy chocolate cake recipe. If you like, after the cake cools, slice it in half and frost with the chocolate frosting recipe. What could be better than a chocolate fudge cake recipe? For a little different but very delicious try this fudge bourbon cake recipe. Cream butter and sugar until fluffy; blend in cooled chocolate. Add eggs beating after each; add vanilla and bourbon and blend in. Sift dry ingredients together and alternately with milk to creamed mixture. Fold in nuts and divide batter evenly between 2 greased and floured 9 inch cake baking pans. Bake 35 minutes or until pick comes out clean; cool 5 minutes and remove from pans. Cool completely and frost with bourbon fudge frosting recipe. This bourbon fudge frosting recipe is great on any fudge cake recipe. Combine butter and chocolate and melt over low heat stirring to blend; cool slightly. Beat egg with 1 cup of sugar in mixing bowl; gradually beat in chocolate mixture. Stir in vanilla, lemon juice and bourbon. Gradually beat in remaining sugar until frosting is smooth and is spreading consistency. Blend in nuts and frost fudge bourbon cake recipe. Chocolate dessert recipes are only as good as the products you use to create them. I am always cognizant of the type of chocolate I use to make my desserts. Learn how I choose which chocolates are appropiate to use for each dessert.